With homes on the ocean or within easy walking distance, and prices from $250,000 to more than $2,500,000, Tilghman Estates is a neighborhood of North Myrtle Beach homes where choice is truly king. This great upscale community in the Ocean Drive Beach section spreads over a 10-block area, with oceanfront homes and lots, lake view homes, and golf view homes as well. Some homes are available at the Surf Club Golf Course and Beach Club as well, with their owners enjoying the privileges of its private members’ club. The Surf Country Club has offered its members the best in golf course facilities for over 50 years, and hosts the Carolinas Open. A Parkland style course, it was designed in 1960 and renovated by John LaFoy to provide a challenge for all levels of golfing enthusiasts. As a resident, you can enjoy a beautiful clubhouse with dining facilities, tennis courts, swimming complex and an exercise room. It doesn't get much better than this! Tilghman Estates is the perfect setting for a family vacation home, retirement home or investment home. You may even want to design your own dream home on one of the many available homesites and lots in Tilghman Estates. At Barefoot Realty, we look forward to helping you find your dream home in Tilghman Estates or any of many other fine North Myrtle Beach homes for sale. 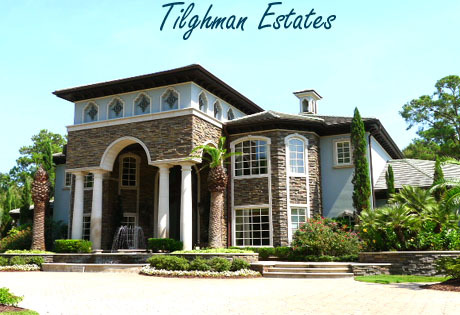 Tilghman Estates Homes- For those who want the best.